If you are a new to wicker furniture, you may not know the routine that experienced outdoor furniture owners know about shopping for wicker replacement cushions. Even if you are an experienced shopper, these 6 tips will simply reinforce your awareness and insight to smart shopping. Wicker cushions is the team used to differentiate cushions primarily used for standard wicker furniture from other types of cushions. Furthermore, and more specifically, people searching for wicker cushions replacement are usually searching for chair and love seat cushions and not back cushions. 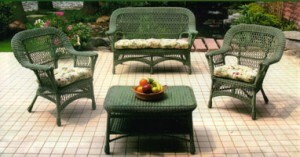 The popularity of wicker sets has spurred a demand for wicker replacement cushions also sold in sets. These typically are sold in a set of two chairs and one loveseat cushion. between the top and bottom fabric panels which hold the filler in place and present a certain aesthetic appeal. Tufted cushions are more economical and perform very well and therefore are more desirable to buy and use by most wicker furniture owners. Wicker Chair: 18×18 or 19×19. Other sizes are definitely possible. Wicker Loveseat: 18×41, 18×42, 19×42 and 19×43 are most common. Other sizes are definitely possible. Choose seat cushions with rounded back corners. The shape of most wicker cushions are typically the same but variations do exist. Most commonly you will find these cushions have rounded-off back corners. The rounded corners are not absolutely necessary for the cushion to fit, if there are stacking holes where the feet would go through the seat. The holes are there so you can stack the chairs or loveseats on top of each other for storage. The rounded corners make the cushion look good as it sits in its position on the seat. Otherwise, if you used square cushions, the corners would stick out through the stacking holes and that would look sloppy and not conform to the shape of the furniture. Most standard wicker furniture uses tufted cushions. That makes life pretty simple. Tufted cushions are designed to fit and fill the seat after the cushion is compressed. That means, when you first get the cushion, it may look a little smaller than the seat perimeter. However, after a break-in period, the cushion will fill in the space. The fill in the cushion is fiber and will compress a little bit when you sit on it. After long use, the cushion will fit and fill the seat area even without having to sit on it. They are designed this way so that the width and depth of the seat initially, doesn’t hang over the front edge of the chair and start looking shabby after you used them for a while and well before the end of their useful life. The more tufts you use, the thinner the cushion will become. For example, a chair cushion with one tuft will be thick, puffy and soft, but will flatten out a bit and loose some of its softness and puffy appearance over time. Four tufts provides a more leveled appearance and provides a little more firmness to the cushion and it keeps its shape a little better than a cushion with one center tuft. the best. Spun polyester provides a nice soft “cushy” feel which is what most of us want when we use a cushion. It can be used indoors and outside. It can’t be harmed by water. Wicker replacement cushions can be made of any available fabrics. The important thing to know is that you need to choose the fabric for its intended use. Many people like indoor fabric when a cushion is used indoors. Indoor fabric is usually either 100% cotton or a percentage of cotton and polyester. Indoor fabrics should not be used outdoors because they may shrink or disfigure and the colors will not last long at all. Wetness may even make the colors run. All-weather fabrics are great because they can be used both indoors and outdoors. They are very similar in feel to the indoor cushions but have the ability to withstand the sun’s ultraviolet (UV) rays for many more hours and are water resistant as compared to indoor fabrics. All-weather fabrics have the widest selection of patterns available. This is a great economical choice if you are looking for the perfect print to go with your furniture. When you need something to combat long hours of strong sunlight and want to use it outside or in a sunroom, Sunbrella fabric is the choice to make. There may not be as many patterns available as all-weather, but Sunbrella fabric will not fade for many years when used outdoors. This fabric is a little more expensive, but worth the extra expense if you are in the sunbelt or using cushions in a sunroom with many hours of exposure to the sun. As you can see, knowing a few things about wicker cushions before you go shopping for them can provide you with the background that you need to shop smart. Not only can you shop for furniture cushions for your wicker set, you can get the proper type of cushions so you won’t waste your time and money.